Review: "Pain of Salvation : Entropia" - Sea of Tranquility - The Web Destination for Progressive Music! While Pain Of Salvation has had enormous growth over the years, Entropia was their album that marked the arrival of one of the most innovative bands in the genre. If you're a Pain Of Salvation fan, you'll know that there is not one Pain Of Salvation album you can grasp on the first try. That's the beauty of their music: secret meanings, different plots, a lot of texture, cerebral lyrics and intelligent concepts. Daniel Gildenlow is a unique artist who likes to explore all sorts of musical ideas and thus he's more creative artistically than most of his contemporaries. He likes to push music in more unexplored directions with each album to express himself. 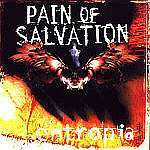 Entropia is Pain of Salvation's debut album; it was originally released in Japan in 1997, but it would take two years for it to break in Europe and Stateside, after the success of their sophomore album One Hour. Hence the reason some people confuse the two CDs. Compared with One Hour, Entropia is more raw in a way, and more fresh. It has more groove and soul, while One Hour was more stiff (yet more focused). Most of the material on Entropia was collected and written when Daniel was in his early twenties. In this aspect the album tends to branch out quite a bit and comes off sounding more unpredictable than the band's later releases. Considering that Entropia is a debut album, that is a very big asset. The music borrows a lot of funk influences, some rock influences, some traditional metal and even some death metal riffs. (The band's original bassist was Gustaf Hielm who later joined Meshuggah.) Also Daniel admits that they may have taken some hints from death metal way back. The song structures vary a lot and they are more loose in a way. The combination of funky riffs and ultra heavy riff-laden approach provides an interesting contrast, and takes the compositions to a totally new ground. Vocalist Daniel is very multi-dimensional: he can soar from a deep bassy tone to a high witched wail effortlesly and effectively. So if you prefer vocal diversity at the highest level over the same boring tone, you are in for a treat. These are only few of the features that make Entropia arguably their heaviest release to date. This is the only album with guitarist Daniel Magdic on it, who contributed a little to the songwriting as well. He lays down some amazing guitar solos, which are a bit longer than the solos on their subsequent albums. I like the attitude he puts behind his playing, more than his advanced technique. Kristoffer's bass is powerful, full of life. His rich bass line in the song "People Passing By" is excellent. The drumming once again is very diverse - listen for the solo on the intro of "Stress". In all the songs the music carries a great deal of unity. The keys enter and leave as the story in the concept begins to take shape and you realize how well-thought the lyrics are on the album. The mix is very crisp and fresh, it allows each instrument to make itself felt and blend seamlessly with each other. But Entropia isn't just about the music. There is so much more to it as far as the concept is concerned. Basically the album looks through the eyes of a small child and his father. When his father has to leave him and his mother to go to war, we are given insight how he aches and bleeds within. The songs scream out rage at the senselessness of war and its outcome. "People Passing By" has a great lyrical theme dealing with the backside of society (this is more vividly explored on The Perfect Element Pt.1), about the people that are made redundant by others. It is about a homeless man who could probably have been a useful individual in the society had it not been for the destructive war. This concept album is presented in three chapters which again sees Gildenlow exploring dark and complex lyrical and thematic subject matters. The title of the album was derived from the words 'Entropy' and 'Utopia'. Entropia is the place where the soldier takes his wife after his return from war. Upon losing his beloved son, he and his wife move to West Entropia (a vague satire at industrialization and technology overstepping its limits?) But he is unfortunately unable to protect her from wrongdoings. There are so many shadings and meanings to this concept, and I highly recommend you try to bring out your own interpretation. Whatever the concept, Gildenlow manages to deliver with emotion, intelligence, integrity, passion, complexity, and poignancy. Favorites would be the 9-minute epic "People Passing By" with its amazing vocal delivery, incredibly articulate guitar solo, and on top of it all its lyrical theme. The lyrics are alive with emotion and sentiment. "Nightmist" is another winner for its blending everything regarding the band's talent and "Plains of Dawn" towards the end of the CD takes the listener to height where he might want to freeze forever.